Phonographic Copyright (p) – Novercia Ltd. Copyright (c) – Novercia Ltd. Copyright (c) – Kate Bush Music Ltd. This Version has misprinted Labels. 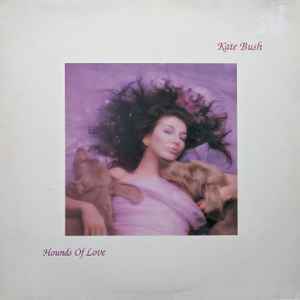 The headings "Hounds Of Love" and "The Ninth Wave" are swapped by mistake. See Pictures. ℗ 1985 Original Sound Recordings made by Novercia Ltd.
Distribué en France per Pathé Marconi EMI. Roaring, and all the wave was in flame"
Tennyson "The Coming of Arthur"
© Kate Bush Music Ltd. EMI Music Publishing Ltd. Lyrics and two images of the singer are printed on the inner sleeve. Sleeve rear has an embossed colourless EMI logo.